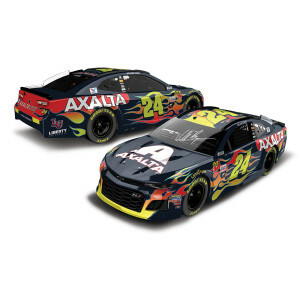 Hendrick Motorsports is proud to offer their most loyal supporters an extremely limited AUTOGRAPHED die cast. You will not be able to find this piece anywhere else. Please Note: This product is available for pre-order and will ship in May 2018. Since its founding in 1984, Hendrick Motorsports has built a legacy that is simply unrivaled with a record 12 team owner championships in NASCAR’s® top series and a staggering 249 victories. Yet the team will begin an all-new chapter when the 2018 NASCAR® season kicks off at DAYTONA International Speedway™. Not only will the new Chevrolet Camaro ZL1 makes its series debut at DAYTONA®, Hendrick Motorsports will take to the track with some new faces behind the wheel. Drivers Alex Bowman and William Byron will take the reins of two beloved car numbers – the No. 88 Nationwide Chevrolet and the No. 24 Axalta Coating Systems Chevrolet. In addition, the iconic No. 9 will make its first laps for Hendrick Motorsports with NAPA-sponsored driver Chase Elliott, keeping the winning car number within the Elliott family. Even the No. 48 of team veteran and seven-time champion Jimmie Johnson will sport a new look at DAYTONA® with a re-imagined Lowe’s paint scheme. Lionel Racing is excited to offer the die-cast of these milestone cars and introduce its all-new Chevrolet Camaro tooling to Hendrick Motorsports fans. Lionel Racing has reconfigured its 1:24-scale Action Racing Collectables (ARC) tool to be a lower-priced hood-open version. Plus, for the first time, Lionel Racing is making a brand-new 1:24-scale ELITE die-cast available to all customers. Each of this 2018 Hendrick Motorsports die-cast is also available in a 1:24 ARC Color Chrome finish and in 1:64-scale.